The Treasured Friends Collection is based on a collection of scarves and fingerless gloves that Susanna Kearsley www.susannakearsley.com had asked me to design for each of her treasured friends, that joined her on this wonderful tour. 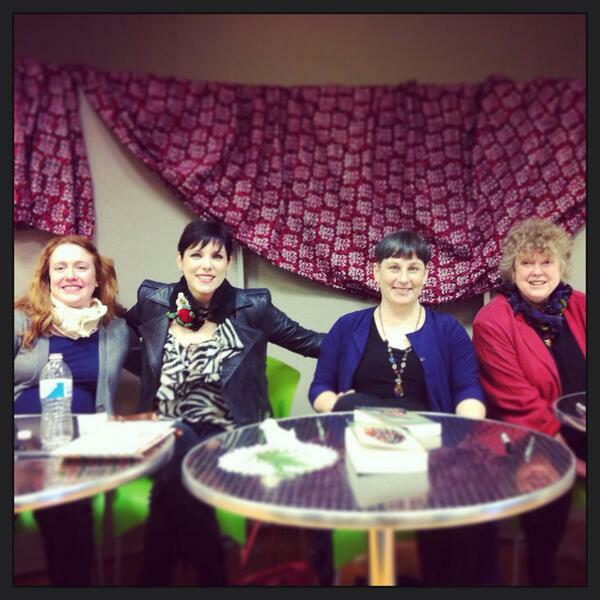 This picture shows some of the fantastic Authors who toured with Susanna Kearsley sporting their unique scarf designs from left to right: Lynn Spencer from All about Romance, Deanna Raybourn, Susanna Kearsley, and Joanna Bourne. Many of the designs were specifically designed for the Author it was given to based on their newest or a previous book or a design that Susanna felt they would like based on who they are or are passionate about. This new collection will be called Treasured Friends. Here are some pictures and some links to a few of these designs. I will be adding more designs in the near future to the Treasured Friends Collection available on my Etsy site at www.intricateknits.etsy.com. MYSTERY GIVEAWAY! I will be joining one of these Authors in a giveaway that will be announced on Feburary 13th so mark your calendars. There will be a variety of ways to enter. Who is this “mystery” Author….you have to wait and see. Pop by in the next few days as I blog more about this great giveaway and the “Mystery” Author. Your first hint…she loves to knit! Thanks to Susanna Kearsley for asking me to be a part of this wonderful venture. I find great enjoyment in designing and making specialty items for treasured friends! Treasure your friends today wherever they are let them know they are special to you! Lynn Rose N Lace Scarf: https://www.etsy.com/ca/listing/169166489/lynn-rose-n-lace-collar-scarf-ivory? The remainder of the Treasured Friends designs will be available soon. Check out all of these wonderful Authors and put them on the top of your reading list today.